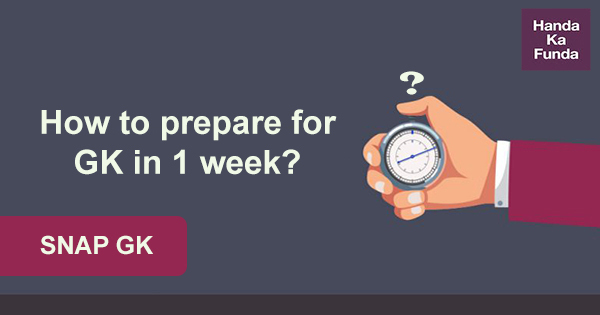 Home » Blog » SNAP GK 2018 – How to prepare for General Knowledge Section in One Week? SNAP is just one week away and the section that is probably the most scoring one is also the most neglected one. Till a few years ago, GK in SNAP used to be weird and I mean really really weird. They used to ask questions like ‘How many hearts does an Octopus have?’. Thankfully, things have improved in the past couple of years. I have given the paper for SNAP 2016 below and that would help you understand the kind of questions that get asked. They would primarily focus on current affairs over the last 6 to 9 months. The questions would be straight forward (unlike IIFT 2018) which you can attempt in less than a second. Most (not all) of the questions would be based on popular topics and events and not stuff that you haven’t heard of. Popular events that made the news headlines in 2018 would be at the top. To cover this, you would need approximately 10-12 hours. I hope you will be able to find that amount of time in the last week of your preparation. If you are not a member of our online General Knowledge course, we have shared some blogposts in the recent past that would really help you prepare. In this blog post we cover Mergers and Acquisition activity from this decade. This list is focused more on Mergers from 2017 and 2016 because the chances of questions being asked on recent events are a lot higher. Questions on books and authors are very popular with entrance examinations. SNAP has had 2 questions almost every year based on books and authors. More often than not, the books about which questions get asked are related to business or biographical sketches of the famous businessmen. In this post we cover heads of important organizations of India and around the world. Questions on this topic have been asked quite frequently in the SNAP GK section. Typically, the questions are based on recent changes. Football club has been promoted to the Premier League Season 2016–17. Who won the 2016 Nobel Prize for Literature? Who will take over as the new UN Secretary General? Who beat Michael Phelops in Rio to claim Singapore‟s first ever Gold Medal in the Olympics. Which country did Germany defeat to clinch the FIFA World Cup trophy in 2014? This Indian company was listed among the Top 50 global R&D spenders in 2015. Which tournament is known as Women‟s “Davis Cup”? Who retired in December 2015 as Chairperson of HSBC India. The project has been launched in to make National Highways free of Railway Crossings? The Oscar 2016 Best Movie? Who is the youngest cricketer to score 10000 test runs? Indian scientist was honored by the International Astronautical Federation‟s Hall of Fame award in 2016. The first Muslim mayor of London? The organization recently signed an agreement to acquire LinkedIn? Flipkart acquired this fashion portal in July 2016? Which operation was launched to evacuate Indians stranded in South Sudan in July 2016? The Lata Mangeshkar Award for Lifetime Achievement in 2016 is given to. Which organization took control of Time Warner Cable? The current Vice President of USA is? Which tenhnology company did Dell Inc, acquire in 2016 and create the largest technology merger in history? The Paralympian was sentenced to six and half years of imprisonment in 2016 for the murder of his girlfriend. Which animal carried out an attack at Disneyland, killing a 2 years old boy? The most realistic humanoid robot did China unveil recently? We got this paper as a PDF that was shared by BullsEye. While there is no short cut to scoring more in an exam but what a lot of students do is to completely ignore the General Knowledge section in SNAP. Please do not do that. Most students study for anywhere from 6 months to 1 year to prepare for Quantitative Aptitude and Reading Comprehension, but they do not give even few hours to General Knowledge. Those are the students who miss out on some easy marks. I seriously hope that you are not one of those students. I seriously hope that you would put in the required hours to prepare for SNAP General Knowledge and ace that particular section. Best of luck for SNAP 2018!